In the realm of physics a subset of fluid mechanics (mechanics of fluids) is fluid dynamics (describes flow of fluids liquids). Fluid dynamics deal with a number of fluid process. One of these is process deals with the increase of speed in the liquid. Occurring when in fluid when pressure, the fluid’s potential energy, alongside the radius of the hole, and height simultaneously are change. This was first discovered by Daniel Bernoulli (February 8, 1700 to March 17, 1782) on the year 1738. Him using a number of tools discovered a formula for calculating the process, thus dubbing it Bernoulli's principle. Moving the way that pressure specifically impacts the velocity of the fluid can be seen in the equation ( P= (1/2)pv^2 ). 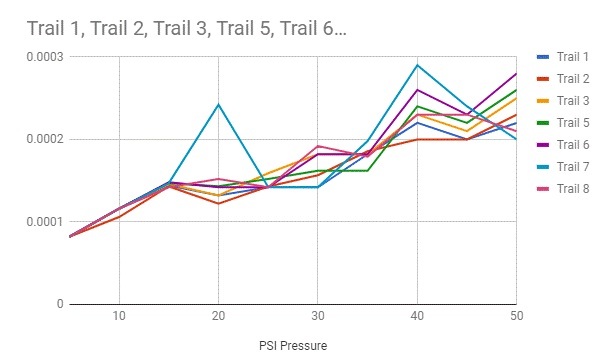 P being pressure in comparison to the V being velocity. The way that pressure can impact the velocity is seen in the equation when the P is higher, thus impacting the v making it higher, as a result of the equation logical outcome. That's why faced with the problem of how does different pressure affect the velocity of water shooting out of a bottle. 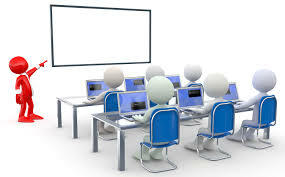 The use of Bernoulli's principle would be used in order to properly calculate the velocity of the water shooting out of the bottle due from the different pressure. Alongside measuring the variables correctly it's important to calculate, and differentiate the difference between the independent and dependent variables. The independent being the density of the water, the height of the water, and the radius of the hole. While the dependent being the difference of the pressure from within the container. Due to Bernoulli's principle when the pressure is higher in the bottle the velocity of the water would be higher, thus meaning it shoots faster. Take the lab equipment to a location, in where it is appropriate for water to be sprayed and measured. Then close all holes in the bottle to contain pressure, pump the bike pump until it is at (5) psi and then release the hole in the side hole. Time with a stopwatch how many seconds it took until the water stopped moving forward. Then measure how far it went with the ruler in meters. Divide meters by seconds to get meters per seconds, and then record it. Then repeat (8) times. After this is finish, repeat the whole process but increase pressure everytime by (5) psi increments. Do this until one gets to (50) psi then stop. 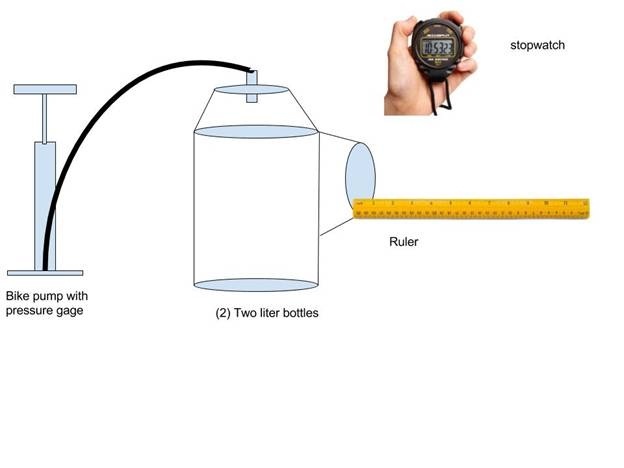 The initial hypothesis, which states that due to Bernoulli's principle when the pressure is higher in the bottle the velocity of the water would increase, thus meaning it shoots faster. 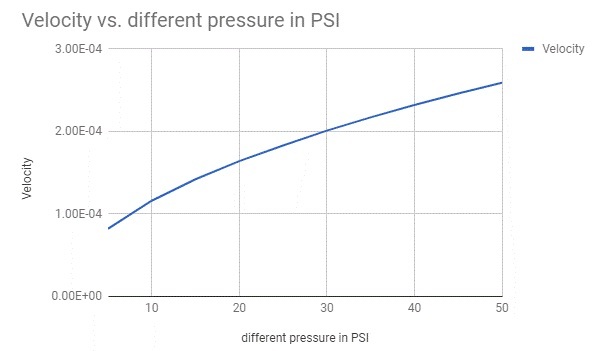 Is correct given how in the lab when pressure is at (5) psi the velocity is at 0.00008m/s, and when the pressure is at (50) psi the velocity is at 0.00021m/s. 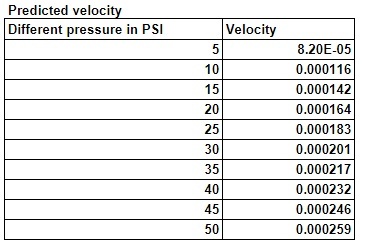 Showing how with the increase of psi there's an increase in velocity thus meaning speed. An error that was found with the lab equipment can be seen with the design of the makeshift bottle which leaked when on higher psi pressure especially when around or close to (50) psi. Especially around the areas where the bottle values were put, this could of been solved with more epoxy glue which was all used up at the time. Another thing that can be used to decrease errors, is with a electrical pump which could be more accurate and less labor intensive. 1. “Fluid Mechanics -- from Eric Weisstein's World of Physics.” Scienceworld.wolfram.com, scienceworld.wolfram.com/physics/FluidMechanics.html. 2. The Editors of Encyclopædia Britannica. “Bernoulli's Theorem.” Encyclopædia Britannica, Encyclopædia Britannica, Inc., 26 Oct. 2016, www.britannica.com/science/Bernoullis-theorem. 3. https://en.wikipedia.org/wiki/Fluid_dynamics - A explanation on what Fluid Dynamics is, and how does its work. 4. https://www.britannica.com/biography/Daniel-Bernoulli - This is a website that tells who Daniel Bernoulli was, and how he contributed to physics.